This intensive 7-day course is a more advanced study of navigation and meteorology which is designed to be interesting and enjoyable. It is intended for those with some practical experience of cruising and is ideal for candidates for the Coastal Skipper practical course and Yachtmaster Offshore exam. The instructor will coach you through the more complex elements of calculating tidal heights, making offshore passages, piloting a yacht safely and understanding and using the weather to best advantage. 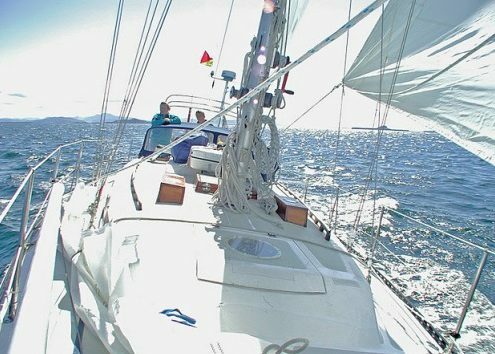 The content of the course is suitable for anyone interested in sailing, motor cruising, diving or sea angling. The course completion certificate is recognised by the Department of Transport as part of the requirement for the Coastal Skipper Certificate of Competence and the level of knowledge required is essential to those who aspire to becoming qualified Yachtmasters. There will be work to be completed in the evenings. At the end of the course there will be three test papers in Collision Regulations, Meteorology and Navigation to be completed. The course fee includes: RYA Coastal / Offshore Theory Pack. Use of RYA Training Almanac. The course will provide you with the background knowledge required to skipper a yacht/small craft on coastal and offshore passages by day and night. Pre-course experience: Applicants must have the RYA competent crew/day skipper theory certificate or equivalent (see RYA Logbook G15), be able to plot latitude/longitude and distance/bearings. You should also have a sound knowledge of international regulations for prevention of collision at sea, flag signals and VHF operator procedures.